ROCKINGHAM, N.C. – Kernersville’s Charles Terrell took out defending champion Vick Helms of Catawba, S.C., in the quarterfinals but couldn’t get past Oakboro’s Joe Hartsell in the combined Pro ET/Footbrake final round of Saturday’s 27th annual Griffin Chrysler-Dodge-Jeep MOPARs at the Rock all-Chrysler event at Rockingham Dragway. Hartsell parlayed a .016 reaction time with a track time of 5.453 seconds (against a 5.400 target) to get his 1971 Dodge Dart into the winners’ circle. Other winners included Fairmont’s Rick Cline, who won the Challenger Shootout; Charlotte’s Greg Do, winner of the Charger Shootout; Leon Hudson of Rustburg, Va., who claimed the featured Small Tire Shoot title, sponsored by Lenny Melton in memory of “Bullet Bob” Reed; and Jason Wirth of West Columbia, S.C., who prevailed in the Trophy class. 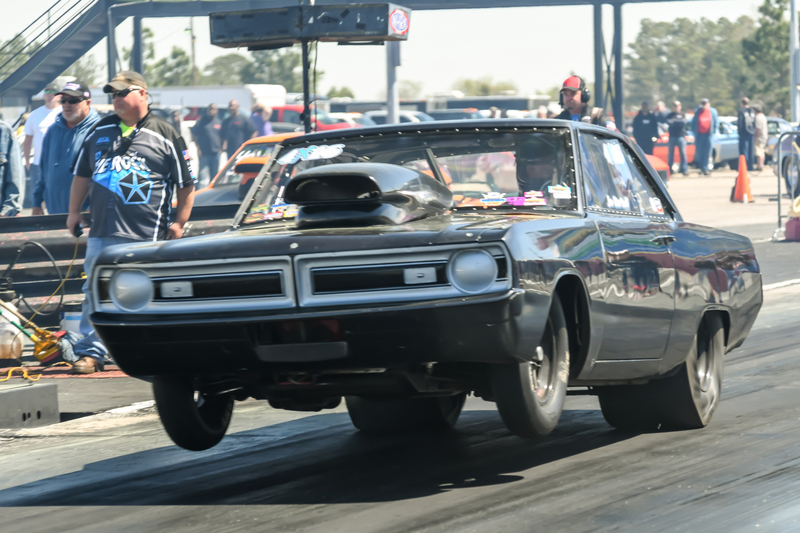 In the “Bullet Bob” Reed Memorial Hemi Challenge, Chuck Hilton overcame an enormous reaction time disadvantage to run down the Barracuda of Jason Sisk in the final round. In the Griffin Motors MOPAR car show, Randy DeBruhl won the Editor’s Choice award in his 1970 Hemi Cuda. The prestigious award, judged by renown editor Cliff Gromer of MOPAR Action Magazine, was presented to DeBruhl for his original 1970 car that has all-late model running gear, including disk brakes. Best of Show Awards went to Mike Gemza in his 1965 Dodge for the Classic Award and Scott Clayton of Charleston, South Carolina won the Modern Award in his 2010 Challenger. 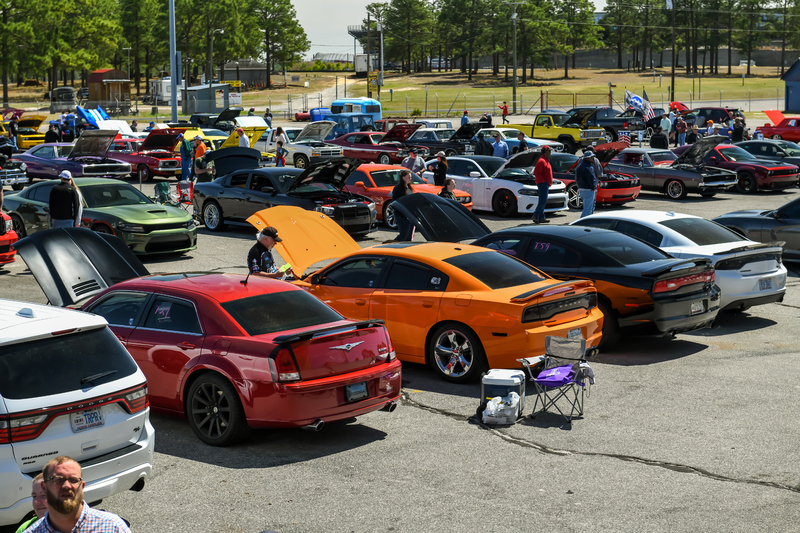 There were over 150 cars and truck entered in the awards show in with judging in 26 classes. MOPARS of Fayetteville won the Best Club Participation with 17 car show entries and Nat Wolfe won Best Truck Award in his 1979 Jeep. ‘BULLET BOB’ REED MEMORIAL HEMI SHOOTOUT – Chuck Hilton, .452, 9.405 on a 9.340, 143.14 mph, def. Jason Sisk, .199, 9.888 on a 9.550, 138.98 mph. Round 3 – Derik Nicholson, .220, 11.189 on an 11.120, 124.55 mph, def. Brian Carbonaro, Seagrove, foul; Jon Sipple, Mooresville, 2016 Hellcat, .171, 10.043 on a 9.900, 118.71 mph, def. Mike Brice, Mt. Holly, .172, 11.816 on an 11.200, 101.67 mph, def. Gary Sanders, Eagle Springs, .207, 11.651 breakout on an 11.800, 109.00 mph, Rick Cline, Fairmont, bye. Semifinals – Sipple, .203, 9.907 on a 9.900, 138.50 mph, def. Nicholson, .099, 11.099 breakout on an 11.150, 126.62 mph; Cline, .034, 13.860 on a 14.000, 99.14 mph, def. Arias, foul. FINAL – Rick Cline, Fairmont, .062, 14.103 on a 13.850, 97.57 mph, def. Jon Sipple, Mooresville, 2016 Hellcat, .312, 9.887 breakout on a 9.900, 137.55 mph. Semifinals – Greg Do, Charlotte, .175, 12.364 on a 12.000, 111.75 mph, def. Unknown #T59, .285, 11.618 breakout on an 11.700, 127.75 mph; Mike England, Morganton, bye. FINAL – Greg Do, Charlotte, .058, 12.087 on a 12.000, 111.68 mph, def. Mike England, Morganton, .383, 11.309 on a 10.950, 128.11 mph. Round 1 – Chip Owens, Marion, S.C., 1970 Plymouth Barracuda, .152, 6.067, 121.91 mph, def. 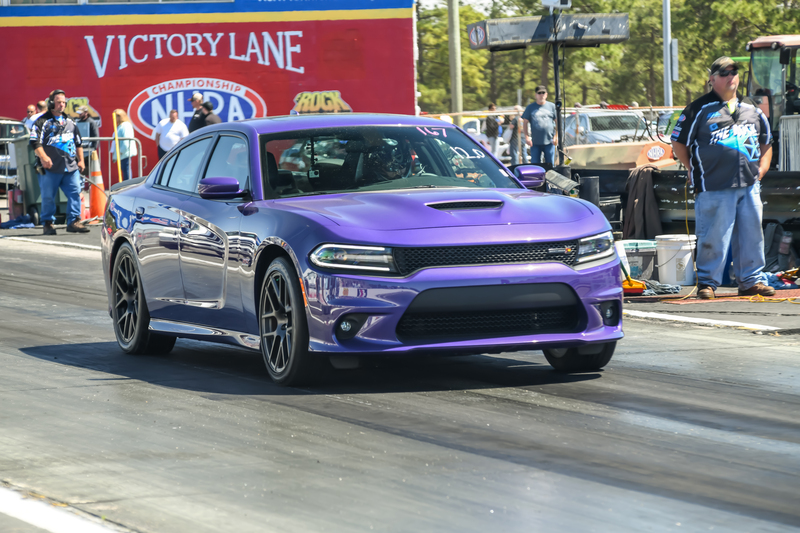 Lenny Melton, Salisbury, 2017 Challenger Hellcat, .778, 8.010, 87.07 mph; Scott Cheek, Greensboro, 1968 Dodge Dart, .159, 6.298, 126.57 mph, def. Sheila Bowman, Kernersville, 1976 Plymouth Duster, no time; Leon Hudson, Rustburg, Va., 1965 Plymouth Barracuda, .038, 5.716, 122.87 mph, def. Anthony Prince, Wilmington, 1969 Chrysler Newport, .314, 8.106, 91.02 mph. Semifinals – Cheek, .295, 5.860, 129.18 mph, def. Owens, no time; Hudson, bye. 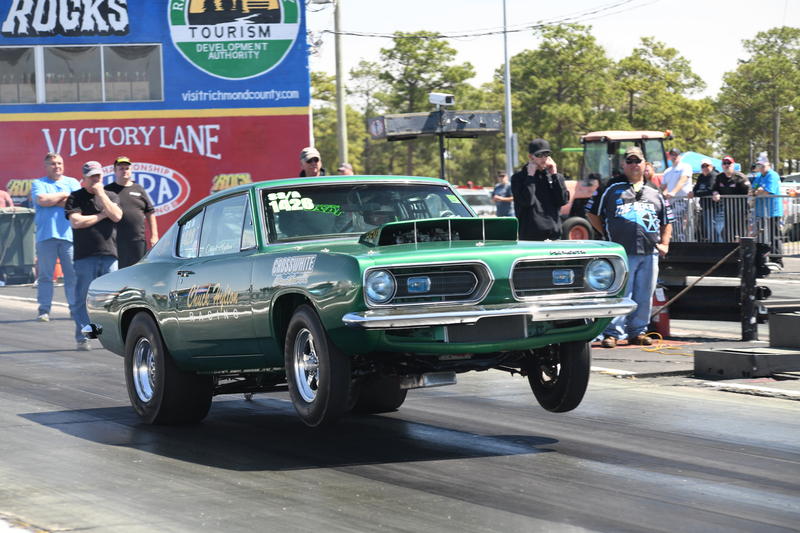 FINAL – Leon Hudson, Rustburg, Va., 1965 Plymouth Barracuda, 5.477, 128.10 mph, def. 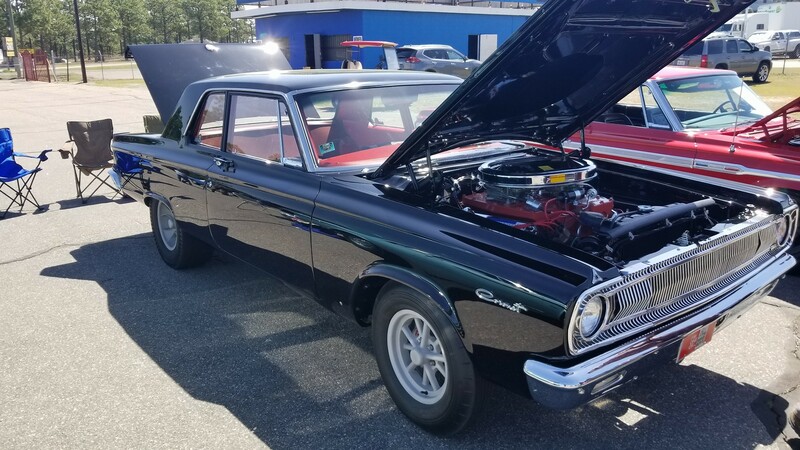 Scott Cheek, Greensboro, 1968 Dodge Dart, .208, 5.404, 130.02 mph. Round 3 – Tony Barker, Stedman, .027, 5.782 on a 5.670, 112.56 mph, def. Terry Honeycutt, Roseboro, .047, 5.793 on a 5.580, 102.52 mph; Joe Hartsell, Oakboro, 1971 Dodge Dart, .038, 5.501 on a 5.420, 116.10 mph, def. C.J. Collins, Mt. Orab, Ohio, 1970 Plymouth Duster, .192, 5.898 on a 5.870, 117.62 mph; Charles Terrell, Kernersville, .024, 5.863 on a 5.790, 117.95 mph, def. Vick Helms, Catawba, S.C., 1972 Plymouth Duster, foul; Johnny Smith, Kopkins, S.C., 1986 Dodge Charger, .012, 5.698 on a 5.680, 121.34 mph, def. Kevin Rollins, Jefferson, S.C., 1973 Plymouth Barracuda, foul. Terrell, .133, 5.914 on a 5.830, 117.54 mph, def. Barker, foul; Hartsell, .023, 5.381 on a 5.410, 126.84 mph, def. Smith, foul. 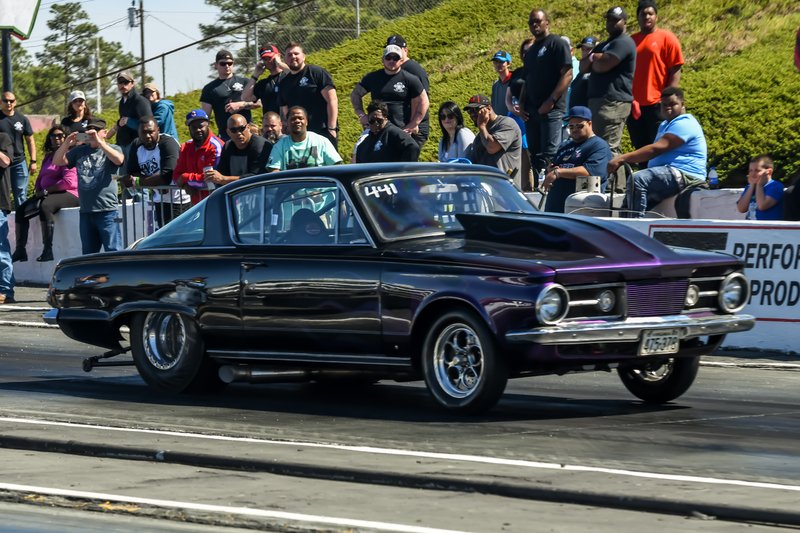 FINAL – Joe Hartsell, Oakboro, 1971 Dodge Dart, .016, 5.453 on a 5.400, 117.50 mph, def. Charles Terrell, Kernersville, .041, 5.936 on a 5.860, 116.67 mph. 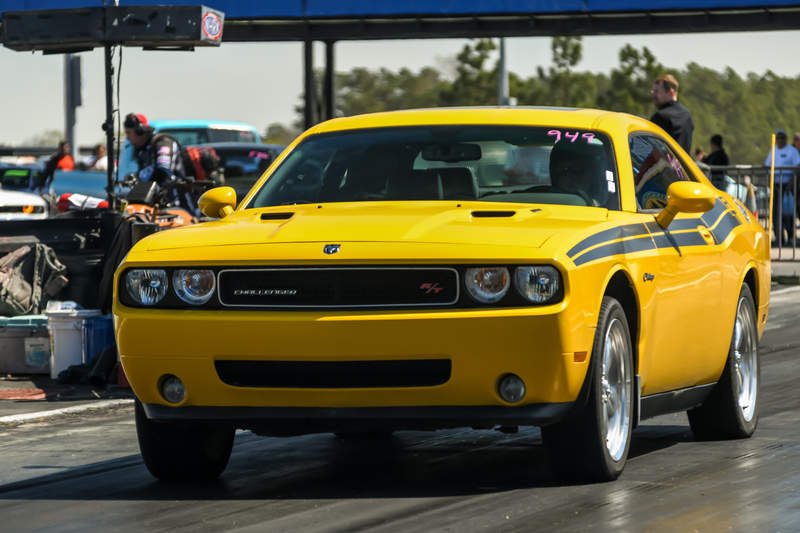 Round 5 – Jason Wirth, West Columbia, S.C., 2006 Dodge Charger, .158, 12.951 on a 12.950, 107.84 mph, def. Tom Lauber, Asheboro, 1969 Dodge Dart, .280, 15.253 breakout on a 15.500, 82.92 mph; Thurman Warren, Dunn, 2014 Dodge Ram truck, .001, 14.447 on a 14.330, 80.63 mph, def. Brandon Church, Trinity, 2014 Dodge Ram truck, .024, 14.846 on a 14.520, 97.51 mph; Wayne Belton, 1972 Plymouth, bye. Semifinals – Wirth, .376, 13.023 on a 12.950, 99.48 mph, def. Belton, .019, 11.426 on an 11.000, 121.04 mph; Warren, bye. 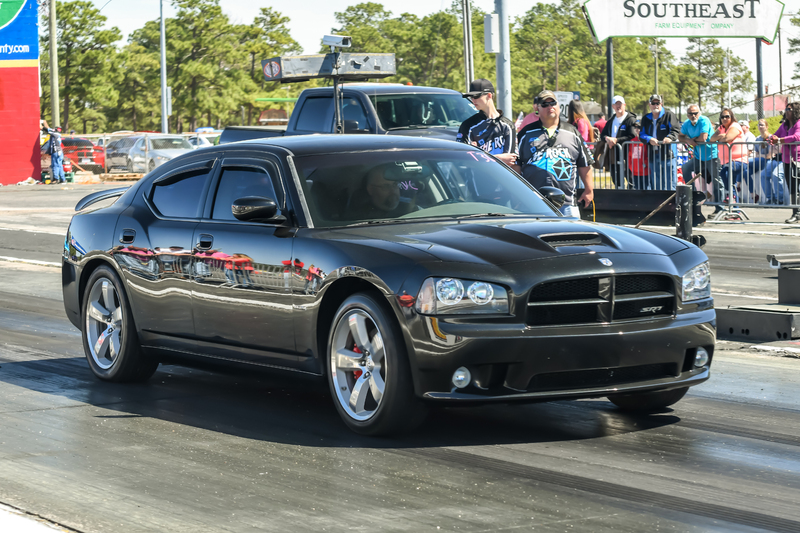 FINAL – Jason Wirth, West Columbia, S.C., 2006 Dodge Charger, .186, 12.994 on a 12.950, 107.81 mph, def. Thurman Warren, Dunn, 2014 Dodge Ram truck, .050, 14.289 breakout on a 14.300, 90.90 mph. Editors Choice – Randy DeBruhl, 70 Hemi Cuda; Best Club Participation – MOPARS of Fayetteville; Long Distance Award – Trey Stanford, New Albany, Ohio; Best of Show Classic – Mike Gemza, Denver; Best of Show Modern, Scott Clayton, Dallas, Georgia, 2010 Challenger; Best of Show Truck – Nat Wolfe, Sherrills Ford, 1979 Jeep. Truck Stock – Mark Ray, Yanceyville, 1979 Dodge.